Think of the biggest cities in the world. The megacities. True giants with populations of over 10 million people. Tokyo will, of course, be on your list. So too Delhi, Shanghai, Mexico City, New York, Cairo. Possibly Lagos, Jakarta and Chongqing if you pride yourself on keeping your geography general knowledge up to date. They are among 10 cities that the UN predicts will break the 10 million mark between now and 2030, bringing the total number of megacities to 43. The rise in the number of megacities is the most visible evidence of the accelerating global trend towards urbanization. In 1950, cities were home to 751 million people, less than one-third of the global population. Just two (New York and Tokyo) had more than 10 million inhabitants. Today, 55% of us live in urban areas – that’s 4.2 billion city-slickers. In another generation, that proportion is set to grow to 68%, potentially adding another 2.5 billion people to already crowded cities. Ninety percent of that shift to urban areas will take place in Asia and Africa. In part, that is down to the very high levels of urbanization elsewhere – four out of five people in the Americas, and three-quarters of Europeans already live in cities. In contrast, cities are home to only half of the population of Asia, and Africa is still predominantly rural. But that is changing rapidly. Right now 22 of the world’s 33 cities with populations over 10 million are in Asia and Africa, as are all except one of the 10 set to join them by 2030. India will see the biggest growth, with 416 million new urban dwellers by 2050. Delhi is due to overtake Tokyo as the world’s most populous city by 2028, growing to 39 million people by 2030. By that time the current megacities of Mumbai, Kolkata, Bangalore and Chennai will be joined by Hyderabad and Ahmedabad. China will gain two more megacities, with Chengdu and Nanjing adding to the six already topping the 10 million mark (Shanghai, Beijing, Chongqing, Tianjin, Guangzhou and Shenzhen). But Asia’s growth is by no means restricted to India and China. Bangladesh’s capital, Dhaka, is predicted to be the fourth biggest city in the world by 2030, with a staggering 28 million inhabitants. 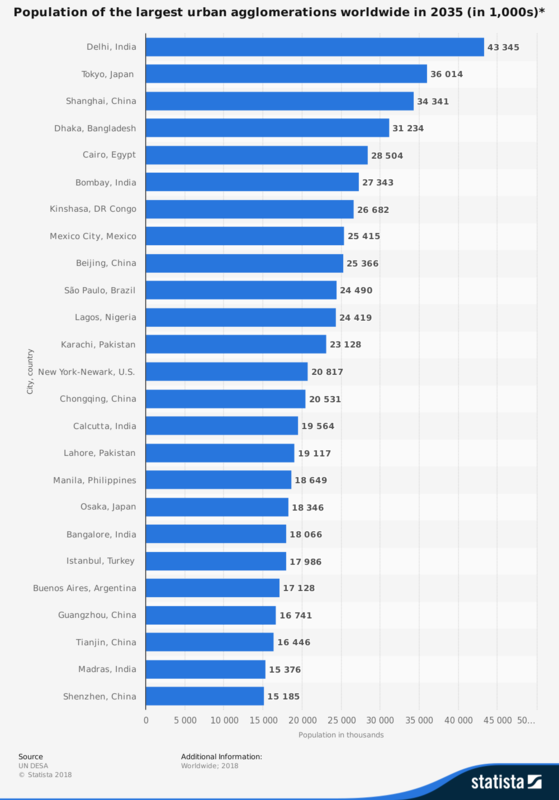 Karachi and Lahore in Pakistan will rise up the rankings, while Manila and Jakarta will see big population booms. The new megacities will include Seoul and Ho Chi Minh City, and Tehran will also break through 10 million people. There is a notable exception to Asia’s population boom, in ageing Japan. Twenty years ago Osaka was second only to Tokyo. But the population of its metropolitan region peaked at 19 million, and is now actually shrinking. By 2030 it will have dropped out of the top 10 altogether. With the most rural population, Africa has the biggest scope for change. Cairo will remain the continent’s biggest city. But Kinshasa in the Democratic Republic of Congo won’t be far behind, overtaking Lagos within the next decade, and on track to break into the world’s top 10. Angola’s capital Luanda is set to double in size to nearly 15 million people. Dar-es-Salaam in Tanzania, another future megacity, is growing by half a million people every year. Surprisingly, no new megacities are predicted at all for the Americas. 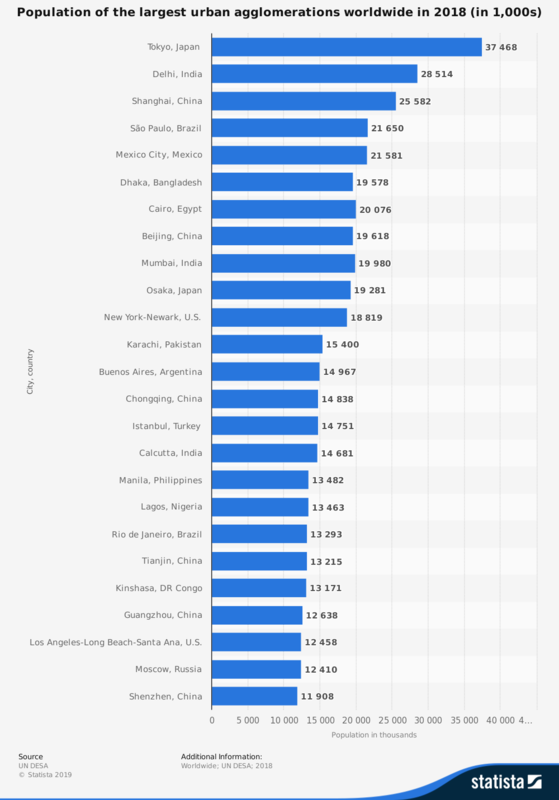 Sao Paulo and Mexico City are currently the 4th and 5th largest in the world. But by 2030 they will have dropped to 9th and 8th respectively – each one still a thriving, growing metropolis, but unable to match the extraordinary expansion predicted in Asia and Africa. In 1950, the United States could boast six of the world’s 20 biggest cities. By 2030 it will have just one – New York. Europe has seen the largest number of cities actually losing population(particularly in Poland, Romania, Russia and Ukraine). But it also contains the only place outside Asia and Africa predicted to achieve megacity status between now and 2030. Not Paris, Moscow or Istanbul – they already make the list. After a period of decline in the second half of the 20th century, and nearly 200 years since it was the most populous city on the planet, London is once again growing fast. The challenges facing the world’s megacities are vast, as millions of people move into areas that are often struggling to support the populations they already have. Housing, pollution, transportation, infrastructure, inequality and social cohesion all require creative solutions.